Eastern Europe. July 2009. The weather was hot, and we were covering a lot of ground on foot every day. Before reaching Hvar, we were spending these long, hot days in cities. We were sweaty and gross. Typical backpackers. Unlike some of our brethren, we tried to maintain some dignity and actually clean our clothes. Every night found us hand washing clothes in our hostel room’s sink, which was plugged up and filled with soapy water so that we could clean our socks, underwear, and t-shirts. It wasn’t pretty, but it did keep us clean and save us from trying to navigate any Hungarian laundromats. By selectively hand washing clothes while traveling, you can pack light and avoid re-wearing dirty clothes. If you’re traveling for a week or more, doing laundry is the easiest way to pack significantly less. We’ll cover some additional, optional tools later in this article. Hand washing is ideal for a few items per “load.” The more clothes you wash, the more you have to find a place to hang dry. The pictures in this article use a bigger load than I would normally wash for illustrative purposes. As with any load of laundry, you should separate white clothes from colored clothes to prevent colors from bleeding. To simplify laundry, I don’t pack anything white. No white undershirts, no tighty whities, and no white athletic socks. For socks, I wear Smartwool PHD micro socks (men’s, women’s) which are low-cut and come in a variety of muted colors. As a bonus, they fit great, can be hand washed, and will dry overnight. Fill the sink or tub with warm water. Steve Boorstein, host of the national radio show The Clothing Doctor suggests, “85 degrees, just warm to the touch.” Using water that is too hot could burn your hands or make colors bleed. While filling the sink with water, add a few drops of a mild detergent or dish washing liquid. You can use a sink stopper to plug the sink. I don’t bother packing one though. If I stay in an Airbnb apartment, the owner often has a sink stopper. Otherwise, I just use whatever is lying around. I recommend the liquid version of Dr. Bronner’s Magic Soap, which Jeremy introduced to me on the Eastern Europe trip mentioned earlier. The soap is concentrated, so a few drops will be enough to hand wash your clothes. Dr. Bronner’s is all natural and can replace most of the liquids you might carry, including body wash, toothpaste, and shaving gel. Add your clothes to the soapy water and gently swirl them around the sink. Scrub dirtier clothes by rubbing the fabric against itself. Apply more detergent directly to the dirtiest spots and give them an extra scrub. After scrubbing, allow the clothes to soak. 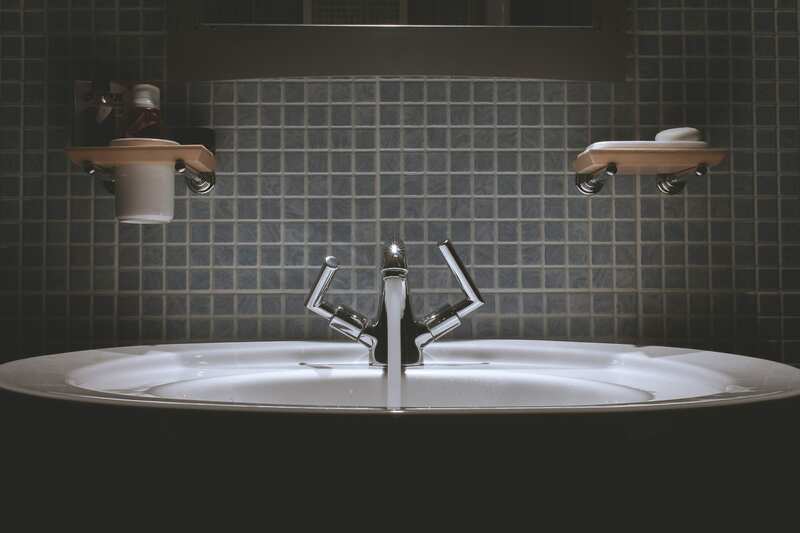 If the water looks dirty already, you can drain it and refill the sink with clean, soapy water. Five minutes of soaking should be enough for most clothes. For dirtier “loads,” let clothes soak for up to thirty minutes. Drain the soapy water from the sink. Rinse clothes directly under the running tap to remove any remaining detergent. Once the water runs clear instead of cloudy, without any soapy bubbles, you know that the item has been rinsed thoroughly. 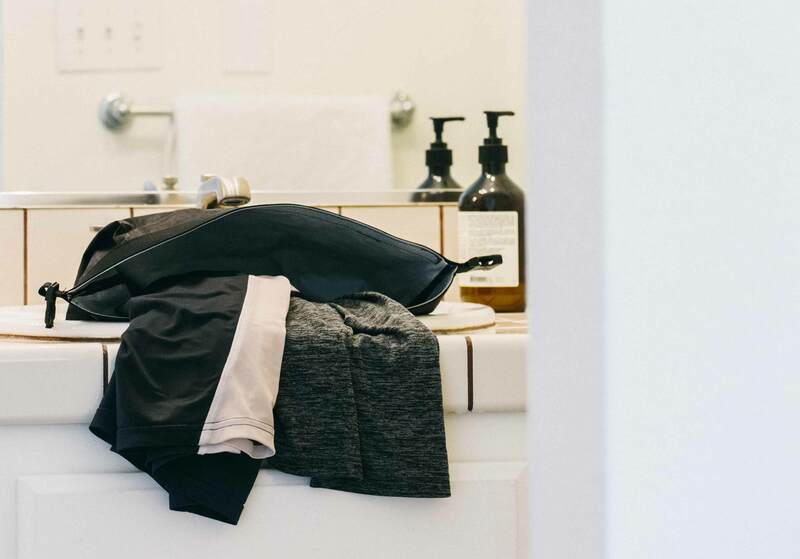 After you’ve rinsed your clothes, you can do some quick prep work to help them dry faster. Thoroughly wring out each item of as much water as possible. Don’t leave your clothes in twists and knots. Re-shape your clothes so that they dry faster and keep their shape. Exposing more of your clothes’ surface area to the air will help them dry faster. For slower-drying fabrics like cotton or wool, we can further expedite the drying process. Lay the item out on a towel. Full-sized or travel towels will work. Tightly roll up the towel to wring even more water from your clothes. Then unroll the towel and re-shape the clothing item as described earlier. Finally, hang your clothes to dry. The more air circulating near them, the better. Hanging clothes outdoors or near a fan or window will help them dry. Most quick-dry performance fabrics will dry quickly. Wool items should dry overnight. Cotton takes the longest to dry. Some travelers recommend packing a travel clothing line to hang clothes to dry. I don’t do much laundry in each load, so I just find a few open spots in my room to hang them. Travel Fashion Girl has written a helpful hand washing guide with great pictures. Hand washing clothes while traveling, using the sink in your room is an easy way to pack less on long trips. Wash your clothes in warm, soapy water then rinse them under the tap. Once your clothes are clean, wring out excess water with your hands or a towel and hang the clothes to dry.